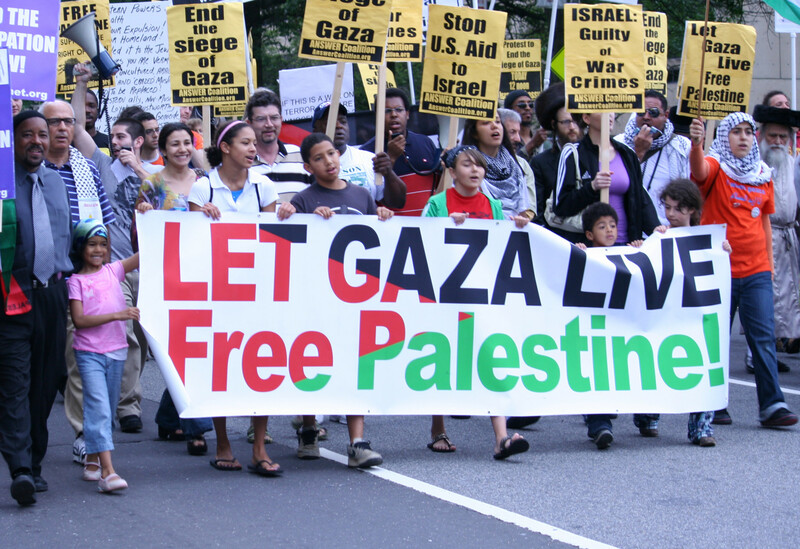 It has never been easy for Arab Americans to advocate for Palestinian rights and while we’ve made real progress, the challenges continue to grow. I learned early on that this wasn’t ever going to be a fair fight. In their relentless effort to silence our voice, supporters of Israel waged a relentless campaign to delegitimise us. During the 1970s and 1980s, groups like the Anti-Defamation League (ADL) and the American Jewish Committee (AJC) used the credibility they had earned fighting bigotry and injustice to defame and exclude us from political participation. I remember when, as a young college professor, I first saw the write ups about me and other Arab American colleagues in the books published by these groups — and how vulnerable it made me feel. It wasn’t just the books, it was the way these groups used the defamatory descriptions of us that took a toll. When we went for job interviews, when we were invited to speak, or when we appeared in the media, the defamation preceded us. In 1978, I was invited to the White House to an ethnic leaders’ meeting with the then United States vice-president Walter Mondale. Three days after that meeting, I received a call from the White House office that had invited me, telling me that because they had received complaints from major Jewish organisations about me being a “pro-Palestinian Arab American” they wouldn’t be able to invite me to any future meetings. The vice-president’s staff members were uncomfortable with what they had heard about me. Much the same happened a few years later when a number of leaders from different ethnic communities attempted to form a council and invited me to chair a group dealing with negative stereotyping of ethnics in the media. Leadership of the ADL not only objected to my involvement and boycotted the meeting, but waged a campaign calling on others to join them. We fared no better with liberals in the peace and human rights community. When the Palestine Human Rights Campaign applied for membership in the Coalition for a New Foreign and Military Policy, we were told there had to be a vote among the existing member organisations. We won the vote, but nevertheless we were pressed to withdraw our application because three Jewish organisations said they would withdraw in protest if we were admitted. Two years later, the same thing happened when the American-Arab Anti-Discrimination Committee applied to the Coalition. We protested and insisted on a public meeting of the membership to make our case. Of the more than 50 groups in the Coalition, again only the same three objected. They argued that our entry would “discredit the Coalition in Congress” and would result in a loss of funds for their work. Liberals, being liberals, we were excluded. In 1983, we were invited to join the 20th Anniversary of Martin Luther King’s March on Washington. Once again, groups allied with the ADL flexed their muscles in an effort to have our invitations scratched and to deny former senator James Abourezk a speaking role at the March. This time, owing to the strong support we received from champions such as Reverends Jesse Jackson and Joseph Lowery and Congressman Walter Fauntroy, we remained in the leadership of the March and Abourezk was given a speaking role. When Jackson ran for president in 1984, appointed me deputy campaign manager, included Arab Americans as part of his coalition, and raised the issue of justice for Palestinians, he faced tremendous pressure from supporters of Israel to drop working with Arab Americans and to be silent on Palestinian human rights. I was present at a meeting with Jackson and senator Alan Cranston when Cranston, who was about to withdraw from the race, told Jackson that he would like to endorse him, but couldn’t because of his advocacy for Palestinians. When Jackson responded that his campaign sought to work with both American-Jews and Arab-Americans and sought to bring them together, Cranston scoffed, referring to me using the derogatory term — “crazy Ay-rab”. When I look back at the progress we’ve made, I can’t help but be proud because of the way our community persevered despite all of the obstacles we faced. When comparing our efforts with those of other ethnic communities that also advocate for their issues, it must be noted that our situation has been unique. In addition to dealing with all of the difficulties entailed in political organising, we had to confront the additional challenge of a zero-sum approach to politics. For our seat at the table, we had to face down more powerful pro-Israel advocates who not only disagreed with us, but used their not insignificant influence to deny our very right to engage in American politics. Today, the challenges remain but have taken new and more ominous forms. Mainstream Jewish groups no longer publish their books targeting pro-Palestinian individuals and groups. Some have farmed the effort out to shadowy efforts they surreptitiously fund, like Canary Mission. Groups like the American Israel Public Affairs Committee reserve their muscle for discrediting groups that have emerged within the Jewish community from the more centrist J Street to the more progressive Jewish Voice for Peace and IfNotNow — working to exclude them from spreading their influence in Congress, on college campuses, and within the Jewish community. Some of these groups also save their firepower to block presidential appointments or to silence Members of Congress when they fear that these individuals aren’t “toeing the line” on unquestioning support for Israel. Foes of Palestinian human rights have also fallen on a new and more ominous strategy to delegitimise and silence pro-Palestinian voices. The efforts to pass legislation like the Anti-Semitism Awareness Act and the Israel Anti-Boycott Act serve one purpose — that is, to silence critics of Israel’s treatment of Palestinians by criminalising criticism of Israel. Both efforts are unconstitutional. The purpose, however, is not to pass good laws. It is to show the power of some pro-Israel organisations to force Congress to jump through a clearly unconstitutional hoop and to intimidate into silence those organisations or individuals who dare to challenge Israel’s behaviour toward Palestinians. The good news is that these efforts will fail. Already, there is significant opposition being mounted by progressive Jewish organisations, mainstream Christian communities, pro-Palestinian student groups, Arab Americans and defenders of civil liberties. There are court cases challenging the constitutionality of anti-boycott laws that have been passed in several states — with two already victorious (in Kansas and Arizona). And effort to cast the bills as threats to free speech — which they are — has gained momentum. So not unlike earlier challenges, we will also face down this one — and win.